The Outback Way takes you back to our ancient past with the traces of prehistoric life with both land and sea fossils being unearthed- as you head from the East into the inland sea … the age of our landscape is captured by spectacular specimens – the best in Australia and the world. Australian Age of Dinosaurs have 6 published dinosaurs with another 6 waiting publication. Single Packages: Want to try it out? 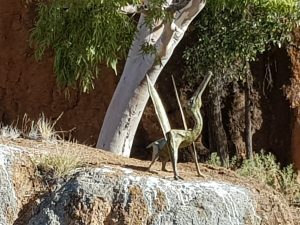 Single packages start from $189.00 for two days and includes membership to the Australian Age of Dinosaurs society for one year, and guided tour of the Laboratory, Collection Room and Dinosaur Canyon. Discounts apply for additional days booked. Twin Packages Bring a friend! Twin packages start from $169.00 per person for two days and includes membership to the Australian Age of Dinosaurs society for one year, and guided tour of the Laboratory, Collection Room and Dinosaur Canyon. Discounts apply for additional days booked. Honorary Technician 10-day packages start from $729.00. WHAT IS DINOSAUR STAMPEDE NATIONAL MONUMENT? The dinosaur trackways at Dinosaur Stampede National Monument were formed 95 million years ago when Outback Queensland was a vastly different place. In stark contrast to the arid climate of today, the landscape was characterised by a great river plain, with towering conifers and lush vegetation interspersed with sandy channels, swamps and lakes brimming with freshwater mussels, lungfish and crocodiles. The climate was humid and cool with an average rainfall of over one metre. It was in this setting that a herd of at least 150 small two-legged dinosaurs, including carnivorous coelurosaurs about the size of chickens and slightly larger plant-eating ornithopods, came to drink at the edge of a lake. Over 3,300 footprints of these long-extinct dinosaurs are scattered over the rock face, stark evidence of the terror they must have experienced as they fled the scene upon the arrival of a large theropod. This snapshot of a few terrifying moments has been frozen in time, immortalising the event and making Winton home to the only known dinosaur stampede in the world. This is truly an experience not to be missed! Set in the grounds of the Stonehouse is an extensive vertebrae and invertebrate fossil display which originates from the Boulia area. 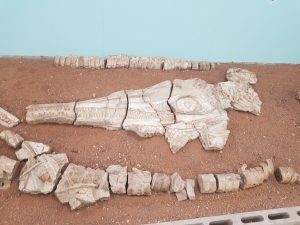 The latest exhibit on display is an 80% complete fossil of a Plesiosaur making this reptile display one of the best in Australia. Visitors are guaranteed to be impressed by the remains of large fossil marine reptiles, sharks and fish and a very expert retelling of their history. Please ring 07 47463386 for further information. ALCOOTA FOSSIL BEDS – are an important paleontological site located on Alcoota Station in Central Australia, 200 km north-east of Alice Springs. It is notable for the occurrence of well-preserved, rare, Miocene vertebrate fossils, which provide evidence of the evolution of the Northern Territory’s fauna and climate. The Alcoota Fossil Beds are also significant as a research and teaching site for palaeontology students. The Alcoota deposit is a series of intermittently interconnected lakes within a large basin. 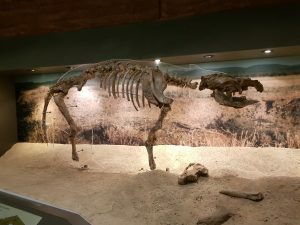 Evidence suggests that the concentration of fossils is due to a phenomenon called ‘waterhole-tethering’: During dry periods, animals concentrated in the immediate area of the continually shrinking, spring-fed lake, resulting in the death of many animals.